A friend introduced me to this graphic novel back in 2003 - unfortunately, it was the French edition so my comprehension of the written words was limited. However, the starkly beautiful illustrations and coloration staying in my mind all these years, so when I happened upon a used English language edition at a local book-seller, I was more than happy to scoop it up.Yes, the narrative is sparse, and unless you're somewhat familiar with the colonial history between the French and the Algerians, you might experience some confusion (easily rectified by watching The Battle of Algiers - http://www.imdb.com/title/tt0058946 or reading Albert Camus' Algerian Chronicles). But the illustrations truly tell the story, and the paper quality will make your fingers sing with joy. Two thumbs up to Drawn $ Quarterly for their excellent attention to detail!Road to America isn't a true story; Saïd Boudiaf is indeed a fictional character. However, the political history it attempts to show is real, and continues to hold true for the citizens of any country trapped between warring factions and longing for neutrality and peace. It's a great little story that unfortunately isn't particularly well told. It moves too quickly and doesn't flesh out the characters enough. Could have been greatly improved by being twice as long. Said is an Algerian teen with a talent for boxing. Although his country is starting to break away from its French colonizers, Said travels to Paris to pursue his boxing career. His brother is involved in fighting for Algerian independence from France but Said just wants to box. The full-color drawings bring Said���s story to life. Set in the 1950���s and 1960���s in a violently anti-Arab Paris, Road to America shows that the old saying is true: you can���t remain neutral on a moving train. I'm not entirely sure whether this a fictional account or not. A few google searches leave me to believe that it's fictional, though it's presented as a factual story by the narrator (but that doesn't mean much).Regardless, it's a mildly interesting story of a man caught between two worlds--Frace and Algeria--as he pusues a dream as an individual.The artwork is stunning, but the flow of the story is choppy, and ultimately I never really care much about the protagonist Said Boudiaf, nor the struggles of his country. I loved the artwork in this (apart from the cover) quite a loose, cartoony french BD style, with plenty of detail and expression and some gorgeous backgrounds. Really lovely watercolour effective with use of white I'd not seen before. The story (or translation) seemed a little stifled, mostly the speach, but a great read non the less. I'll seek out all his other works. 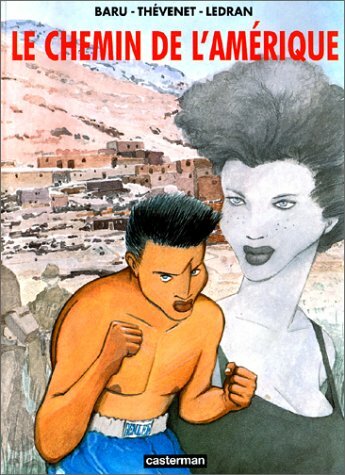 An Algerian boxer just wants to be a boxer but is forced to choose sides between the French Nationalist front and the Algerian liberation front in the late 1950s during Algeria's bloody struggle for independence. The ending was unexpected, and a bit unsatisfying. Boxing and politics are a perfect match in Baru's effortless and sparse biography of a real fighter caught in the French-Algerian War in the 1950s and early '60s. Impressive storytelling, evocative due to the author's ability to choose the exact right details. Another terrific example of the power of the graphic novel. A tiny chapter in history gloriously presented in detail. I had never heard of, honestly, almost anything about his story or the revolution and the mysterious ending to his story is titillating. Gorgeous art and brilliant, filmic storytelling. It's a shame that this book isn't better known in the US.